A significant portion of Love & Mercy is devoted to Brian Wilson’s production of The Beach Boys record “Pet Sounds.” Wilson enlists a room full of session musicians rather than the Beach Boys, who are utilized solely for vocals. The studio players were known as The Wrecking Crew, and it was from this group that the band found its replacement for Wilson on the road, Glen Campbell. 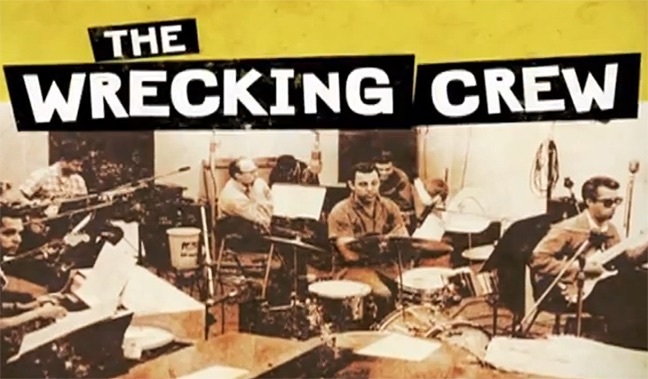 Denny Tedesco, the son of session guitarist Tommy Tedesco, has written and directed a fascinating documentary that chronicles the heyday of The Wrecking Crew, who played the music on a seemingly exhaustive list of pop records in the the 60s and 70s. Working from interviews of the players and the acts they backed, as well as home movies of his father, Tedesco provides great insight into the times as well as the life of a working musician. The interviews are particularly fun. Roger McGuinn of The Byrds, who had been a session player himself, had to break it to the band that the rest of them wouldn’t be playing on their hit single “Mr. Tambourine Man” which didn’t go over well. As McGuinn recalls, The Byrds produced two tracks in three hours during the “Mr. Tambourine Man” session, while it took 77 takes to produce “Turn, Turn, Turn” which the band insisted on playing. Tommy Tedesco tells the story of The Gary Lewis and the Playboys guitarist who confessed he could never play what Tedesco had played in studio on tour and always felt embarrassed when fans complimented his playing on the records. Peter Tork of The Monkees tells a poignant story of the disappointment he felt when he was invited to come to the studio for the production of a Monkees tune only to learn that the invitation was solely as an observer. On an up note, Mickey Dolenz reveals that the studio musicians taught him how to play the drums in preparation for his Monkees tour. Obviously, the days of a small crew of players backing most of the pop radio play (and film and televisions tracks and radio and TV commercials) coming out of LA couldn’t last, but this is a blast of a documentary that also serves as a loving remembrance of the filmmaker for his father.